Truro City boss Steve Tully says they have "nothing to fear" in the replay after their 2-2 FA Trophy draw with National League side Macclesfield Town. Ollie Knowles gave City a 61st-minute lead, but two goals in 10 minutes from Town put them in front before Isaac Vassell got an 88th-minute equaliser. "We're pleased to still be in it, but overall we're disappointed we haven't won it," Tully told BBC Radio Cornwall. "We switched off for eight to 10 minutes and that cost us," he added. 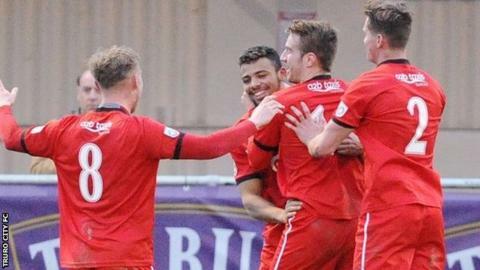 It means a replay at the Moss Rose on Tuesday for Truro, who held their own against opponents who are fully professional. "We'll go up there with a plan and we've got nothing to fear, so we'll give it out best shot," Tully added. "Most of our players will have to take a day off, so it's a big ask, but it is what it is. "We're delighted to still be in the hat, delighted by the way they performed, and we'll go again on Tuesday night. "These are the teams we want to be playing week in, week out, and these are the games we want to be playing week in, week out."